The new editing platform from Sobratema will be one of the best gifts that the market will receive in the 30th anniversary of the entity. With this updating, for example, the magazines will be accessed from an integrated digital platform, in a completely interactive way, allowing the user to read articles, expanding links referred to the subject and showing complementary videos, such as field case studies. According to Paulo Oscar Auler Neto, vice-president from Sobratema, “the platform is finished and will be presented during the year, in the program of events that commemorate the entity’s birthday”. And this is just the first step. Strengthened, the marketing department from Sobratema is more and more committed with campaigns to improve digital advertising that—as shown by the new trends of the industry—may also be dynamic and interactive. “In the same way that was used in the Equipment Guide—that is currently completely digital—we are studying the feasibility of partially migrating M&T and Grandes Construções magazines, turning them more powerful in the digital platforms”, explains the manager. According to the director of Instituto Opus, Renato Grampa, all digital platforms of Sobratema will be updated. 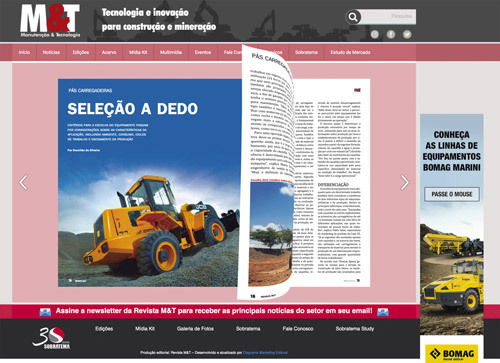 Currently, the sites of M&T and Grandes Construções magazines are completely responsive. In other words, they can be adapted to any way of access used for Internet. This reflects also in its other websites, such as the entity’s homepage itself. “The site remained for a long time with old technology, harming the navigation of those who were accessing it through smartphones or tablets”, explains him. In addition, the updating strengthens the editorial content of the magazines, which was consolidated along this time as a technical reference in construction and mining market, in equipment and in processes, projects and services. Both magazines received—in the person of their editors—important awards in the communication field, such as the Prêmio CNH Industrial de Jornalismo Econômico and the Prêmio Especialistas – Negócios da Comunicação. This last five-year cycle also marked a stronger insertion of M&T magazine in international events of the industry, with local coverage of the most important world trade shows, such as bauma (Germany and China) and ConExpo (EUA and Chile). About the Equipment Guide, another important product of Sobratema’s editing area, the reference material—that was sold before only in a printed version—became more complex and may currently be accessed in a free and interactive way. Now—when an equipment is chosen—some tools of the application (a unique service) show the closest dealer in the region of the user that is accessing the system, opening a platform similar to that of Waze (application for mobile devices based on navigation by satellite) that also shows the best routes to reach it. The page of the Opus Institute was also improved. Just as the Guide—that was integrating the association’s website—the training program will now have its exclusive and dynamic website. “In this updating, all sites are in Microsoft platforms. This ensures better navigation, speed and stability to the system”, says the director of the program.